David Walker, FASLA, in collaboration with his father, Peter Walker, FASLA, led PWP’s design at Barangaroo and they served as Partners-in-Charge for the project. They used Vectorworks every step of the way, and will continue to use it until the completion of all three districts. Through this project, PWP Landscape Architecture has developed a tradition of design practice that responds to, as well as influences, its environment. The PWP team works diligently to balance constructed and natural systems and is passionate about finding beauty in both. Barangaroo Reserve transforms a huge expanse of empty concrete into humane, usable space with ecological goals always in sight. All plantings are native, not just to Australia, but specifically to the Sydney area. And Barangaroo has been selected as one of 17 precincts worldwide to participate in the Clinton Climate Initiative Development Program, with the goal of reducing on-site CO2 emissions to zero. The project has also been recognized as a C40 Climate Positive Development, which commits a constructed development to be carbon neutral, water positive, and zero waste. The materials removed from the site, such as the kilometer of concrete caissons and asphalt that formed the concrete container port, were ground up and used for base layers and soil to create the headland. Using the site-harvested sandstone for the foreshore edge eliminated the energy and exhaust of thousands of truck-loads through the city. The other two districts, Barangaroo South and Central, are scheduled to be completed in the next several years. Barangaroo South is an extension of the Sydney CBD. It’s a perfect contrast to the Reserve: with more than 50 bars and restaurants, it takes on the social outlet role at Barangaroo. It also features a new ferry terminal and pedestrian walkway to allow visitors easy access to and from the city. Barangaroo Central is the last part of Barangaroo to be designed, and will be the last to be built. Another major connection between Millers Point and the harbor, it will provide entertainment space for major public events and festivals. “Being able to break out levels of detail at different stages of development, whether conceptual or schematic, and using Vectorworks to manage the different workflows has been, and will continue to be, the most useful capability during the course of this project,” said David. 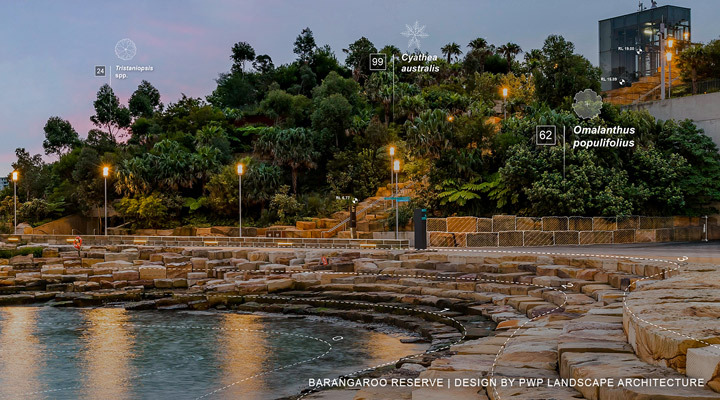 Barangaroo Reserve has become a “must see” for locals and visitors to Sydney and has received more than 7,000,000 visitors since its opening in 2015. The project has already won multiple awards, including the Banksia Foundation Sustainability in Design/Build Award, Australian Institute of Landscape Architects President’s Award, President’s Award of the Australian Engineering Excellence Award Sydney, World Architecture News Award, Architizer Award, and the American Architecture Prize. The project is expected to be fully completed by 2024, which will coincide with the Barangaroo Sydney Metro opening. Once completed, Barangaroo will accommodate more than 23,000 workers and residents and attract thousands of visitors each day.